I also at the same time feel the mechanism might be too sensitive and the wheel stops too abruptly. Hey, why not use the original spring? 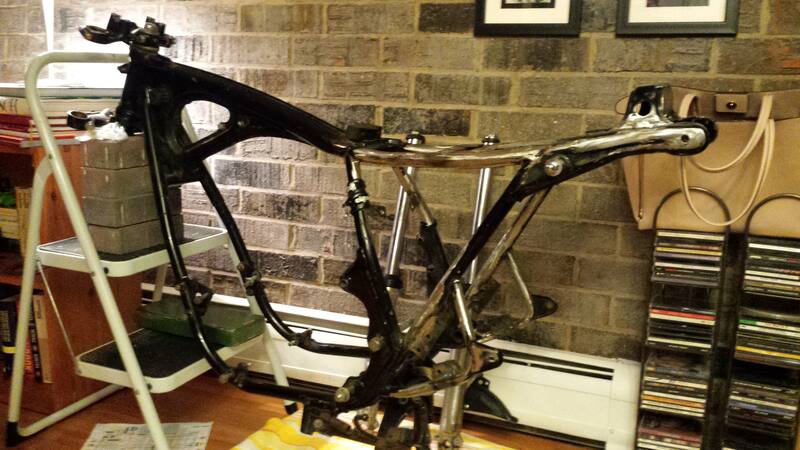 Mind if I ask how you attached the plate to your frame? Did you weld on tabs or ? I'm working on rear sets and may wind up doing something like this. As to the wheel stopping too abruptly my guess would be that with the wheel under load (and actually being driven down a road) that the brake might behave very differently. I would have to reconstruct my design if I wanted to use the original spring. I'm not sure how that would work. Most rearsets I've seen don't incorporate it. Here is the only photo I have of the tabs. Yes they are welded on. It took a little bit more work than I thought. The ears stick out a bit from the frame. The angle of the tabs needs to be right otherwise the plate sits crooked and your levers do as well. It took several tries getting that angle right and then tacking it in place. You might right about the wheel not being in contact with the ground. I was thinking the same thing. I never had a center stand on a bike so I'm not sure. You need a return spring. Most rear sets have a means for incorporating one. Using the stock brake pedal makes your situation a bit more difficult. 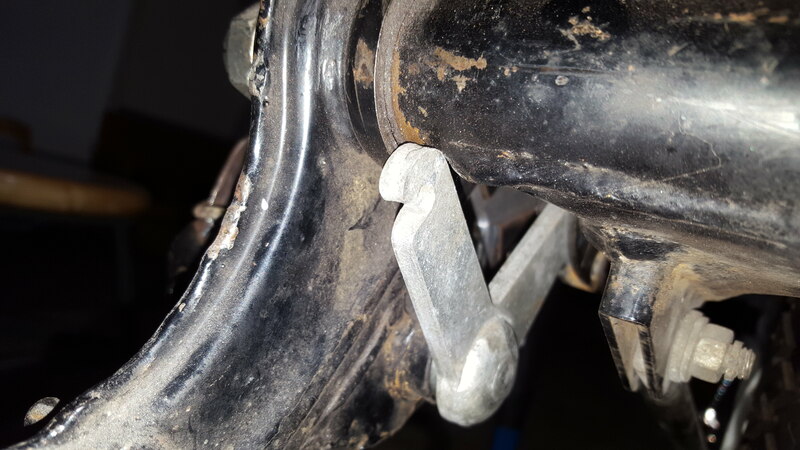 You have essentially created custom "foot pegs" as rear sets have the peg and pedal incorporated into a single mechanism rotating on a bearing. The rear drum lock-up you can adjust out by the rod so that it requires a longer push of the brake pedal before it comes up full stop. Yes, it is easier to adjust under load to insure you have it set right. Alek, you can use the stock spring and it’ll help a lot. If you ground off the little hook where the pedal originally slides on then you’ll have to weld it back on. Grind the forward most “ear” so it has a little relief so the spring has someplace to hook to. See the below picture of my old setup. Here you can probably see the spring and how it’s hooked around the front ear. You can bend your own hook so it actually works. Use heat to get it cherry red and bend it but somehow shield the rest of the spring. I don’t think it’ll maintain it’s spring if you heat the whole thing. Cal, I don't follow, it sounds like the spring would come loose easily off the edge of the pedal. It probably works I just don't see it. 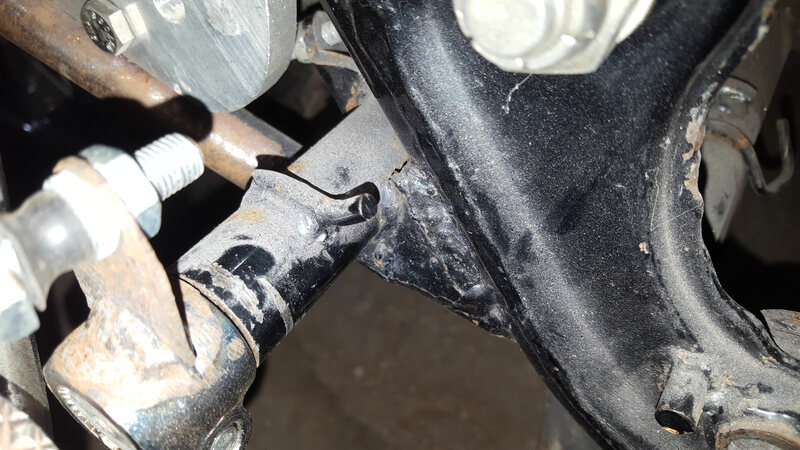 Front brake rod pivot? Dave, Is this the hook? In your photo it looks like the spring would attach underneath the spacer. I can't tell. I don't have anything like that on my bike. When I refer to the ear I mean that whole hoop that the rear pegs attached to. I'm thinking maybe there is a way to attach the rear stop switch spring to the spacer and that might work. Yeah, that’s the little hook. 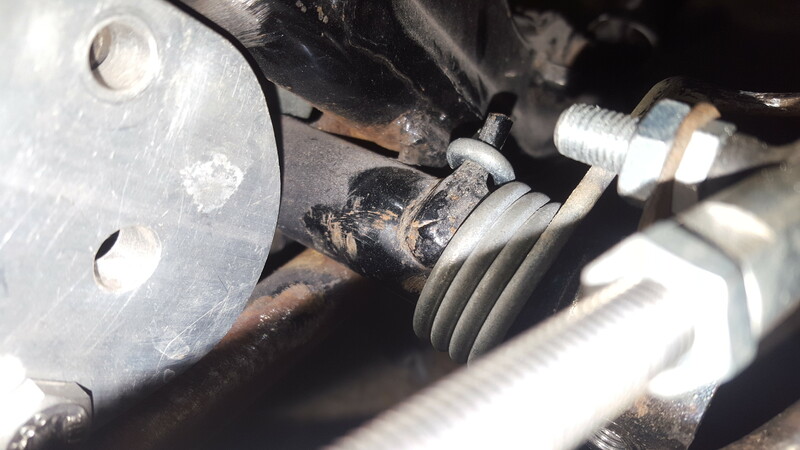 Put the spring back on and instead of it wrapping under the brake pedal as it normally does, just have it hit the tab on the left side of the picture. Cut a notch so the spring doesn’t slip. As I said before, you should be able to cut, heat and bend the spring so it fits nicely. Ok now I see. Propane torch won't get it cherry though.... I'll have to make some calls. Grab a bottle of MAPP gas. Works just fine. You're not the first to tell me that. Really? I don't need a specific torch and tip for that? If you have a propane torch, it will work fine for MAPP too. Burns hotter than propane. Just Mapp gas alone will work, no oxygen? Anything else I'll need to know? Just mapp. Works like propane. Yellow canister at the local Home Center store. Does Mapp burn at a higher temp? I busted out my welding book. 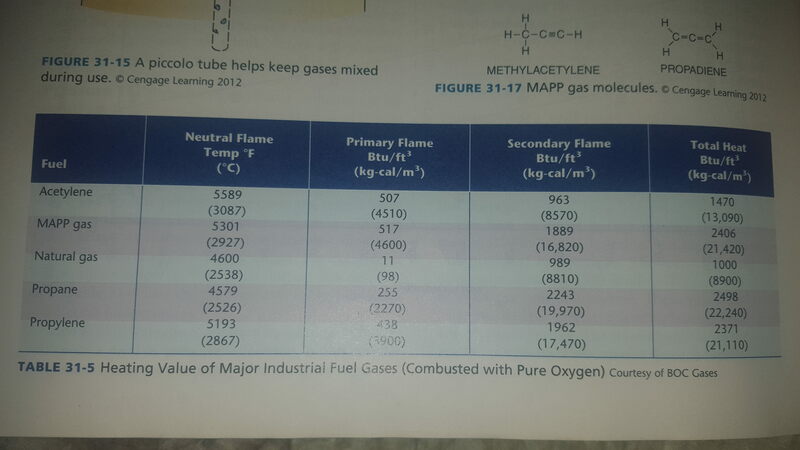 The values are shown with oxygen but look almost the same for Propane vs. Mapp. What I'm trying to get at is why Mapp will work better than Propane for bending steel? I will try the propane first, it didn't get my cylinder studs cherry when I was removing them but those are thicker then the spring. I'll see. Is this how the spring is supposed to sit? It feels loose maybe it's just because it's not under tension? The hook part is long if I bent that I could wrap it around the tab. I think I should cut it but before doing that I tried to heat it up with propane in the area where I would bend it and I couldn't get it quiet cherry. Good enough for you Cal? I haven't cut in a notch. I thought of bending the spring some more, but if it works maybe I should just let it be. Nice job, but I would rotate the pedal downwards so it’s always connecting the spring assuming it then won’t be too angled for your foot. Seems like it’s being held by the nut and bolt well enough. Or bend it again and shorten up where the bend is. The spring is in contact at this position, might not look like it. I could adjust it furthur downward. I think I'll bend the spring a bit more so it hooks more than it does now, if you know what I mean. 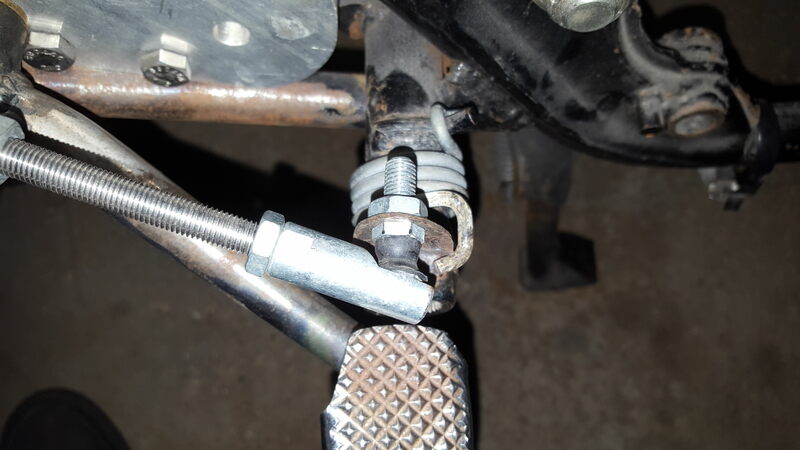 Is this where the rear brake switch spring mounts? I seem to have lost the corner bracket. Would I be able to make the switch work without the bracket by zip tying it to the back of the frame rail? Seems like it would work all the switch needs is to be pulled by the spring. 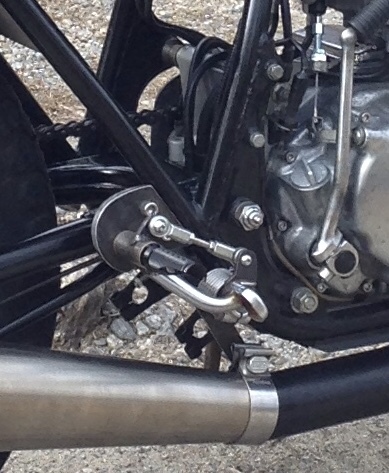 The bracket which holds the brake switch is mounted with an engine frame bolt. Yes, that looks like the brake switch activator but maybe the image was flipped because it’s a weird perspective. Here is the bracket I was referring to. No, I’m saying this bracket is mounted to an engine frame bolt.